Vic Law dribbles to the basket. 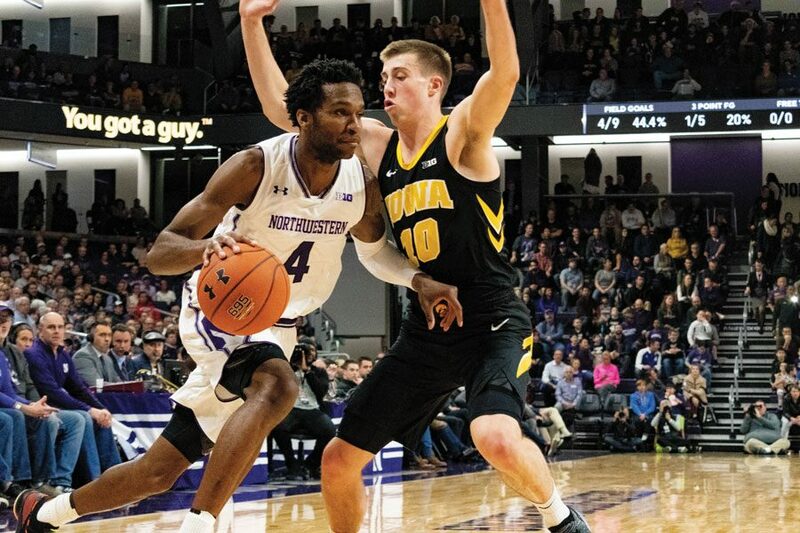 The senior forward scored 24 points in Northwestern’s loss. And, on Sunday, Northwestern’s heart was shattered to pieces. With about two minutes left in Sunday’s game, the Wildcats were up 11 points on No. 20 Iowa and on their way to a massive resume-boosting win. Only minutes later, they walked off the Carver-Hawkeye Arena floor on the losing end of an 80-79 result, despite being ahead for all but one second of the final 32 minutes. The shot that sent the Hawkeyes fans into ecstasy came from the right hand of Jordan Bohannon and after an unusual sequence. After senior forward Vic Law missed the back end of a 1-and-1 with 10 seconds, Connor McCaffery brought the ball up and looked to feed the ball to Joe Wieskamp coming off a curl cut. The ball did not get there, as the ball went off graduate guard Ryan Taylor’s foot for a kick-ball violation. The referees went to the monitor to decide how much time should be on the clock and decided on three seconds. McCaffrey was the inbounder on what became the final play for Iowa (19-5, 8-5 Big Ten), standing right in front of the scorer’s table in the frontcourt. The Hawkeyes started in a box set. Isaiah Moss, who started on the far elbow, came off a screen on the opposite block and ran to the near corner, but was unable to get open for the pass. Bohannon set a back screen for Tyler Cook, who ran toward the rim for a lob, but that was not open either. Wieskamp was unable to post-up Law. That left Bohannon, running towards the three-point line after setting his screen for Cook, as the only option for McCaffery. The freshman guard passed to Bohannon, who immediately took a dribble to his right. After the dribble, Bohannon went into a fade-away jumper from multiple feet beyond the three-point line. Sophomore guard Anthony Gaines had a hand in Bohannon’s face, but it was not enough. “Ice in my veins, right?” Bohannon said after the game. There were still 0.6 seconds left for NU (12-11, 3-9) to salvage the game, but Law’s three-quarters-court pass to senior center Dererk Pardon only led to a deep heave that bounced off the back of the rim. Iowa’s comeback was sparked by backcourt partners Bohannon and Wieskamp. Wieskamp hit a trey-ball with 2:04 left to make the score 76-68, Bohannon nailed a three on the next possession to make the score 76-71 and then Wieskamp hit a layup to make it 76-73 with 42 seconds left. Pardon then hit two free throws, but Bohannon hit a layup to keep the score within three points. Junior forward A.J. Turner was then fouled, but missed the front end of a 1-and-1. Moss then hit a contested floater to make the score 78-77. After struggling over the last few weeks, the Cats played their best game in a while. Law looked healthy for the first time in over a month and it showed in the stats, as he went 9-for-14 from the field and had a double-double with 24 points and 10 rebounds. Turner scored in double digits for the first time since the 73-63 loss to Iowa on Jan. 9, dropping 15 points on 6-for-8 shooting. Pardon and Taylor also reached double figures, with Taylor scoring 16 points — a personal high in conference games — and Pardon had 13. NU is now 1-6 on the road on the season and without a Q1 win, both big factors the Tournament Committee will look at when the time comes to decide who makes the NCAA Tournament. But, before that happens, the Cats need to win some more games for that to become a possibility.